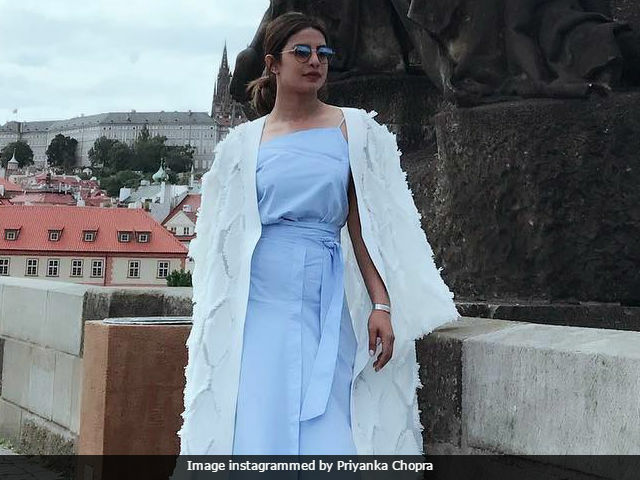 Actress Priyanka Chopra is touring Prague with her team and her pictures will undeniably give you vacation goals. The 34-year-old actress was briefly in India and left for her international commitments over the weekend. But first, Priyanka made a stopover at Prague to relax with her team. Priyanka Chopra looked gorgeous in a Camilla and Marc dress paired with a lambert coat from the shelves of designer Tanya Taylor. Priyanka Chopra's travelling style tip is definitely about blending comfort with style. Priyanka Chopra posed at Prague's famous Charles Bridge and concluded the day with a team dinner in the vicinity. Priyanka Chopra is arguably one of Bollywood's busiest actors as of now. Priyanka was last seen in Hollywood film Baywatch which tanked at the box office (in India and abroad). Priyanka will soon reprise the role of CIA agent Alex Parrish in American television show Quantico. Before that the Bajirao Mastani actress will reportedly shoot for two Hollywood projects. Variety magazine recently reported that Priyanka Chopra will be seen in Silas Howard's independent film, A Kid Like Jake, which will also feature Octavia Spencer, Jim Parsons and Claire Danes. The other film Priyanka may do is titled Isn't It Romantic opposite Rebel Wilson and co-starring Adam Devine and Liam Hemsworth. Priyanka's last Bollywood film was Prakash Jha's Jai Gangaajal. She is in talks for signing Sanjay Leela Bhansali's film. Priyanka has earlier worked with Mr Bhansali in 2015's Bajirao Mastani and National Award-winning film Mary Kom.